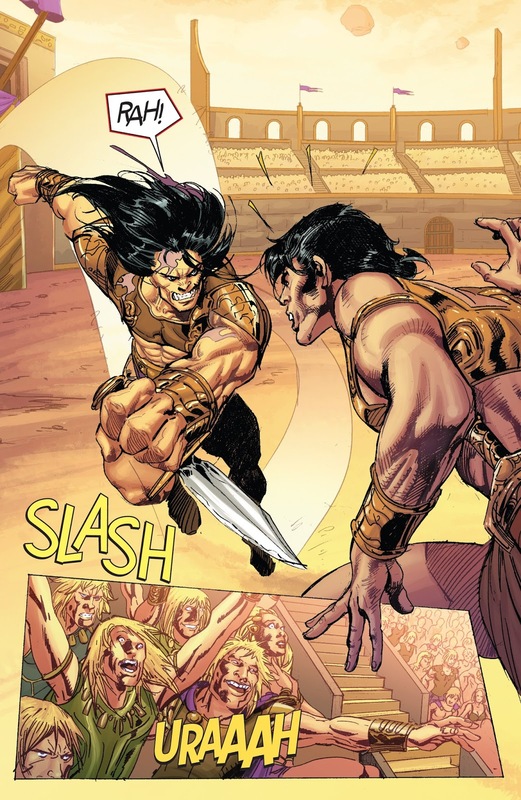 Lords of Mars treats us to the meeting of the two great adventure heroes created by Edgar Rice Burroughs. 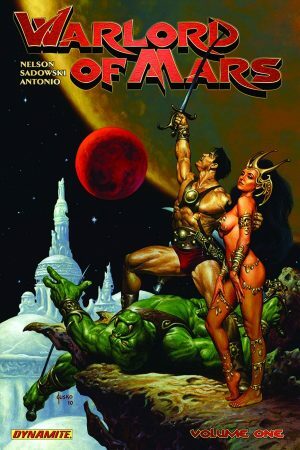 Tarzan has been rescued from his jungle and is now experiencing his English heritage as Lord Greystoke in 1910, while on Mars, or Barsoom as it’s known to its population, John Carter, ruling his own kingdom, sets off to meet the new leader of the Therns. 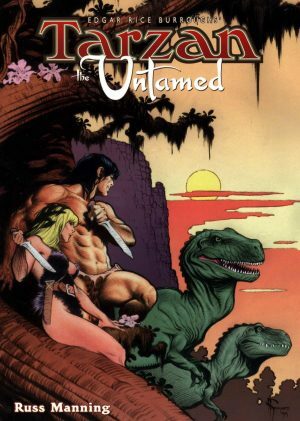 Under dubious circumstances Tarzan and Jane are transported to Mars. Due to Earth’s higher gravity Earthmen on Mars have the equivalent of super strength, and almost seem able to leap tall structures in a single bound. Arvid Nelson’s plot exploits the characters as defined by Burroughs well. Tarzan may now live in England, but he still applies the law of the jungle and is inclined to take things as he sees them rather than look beneath the surface, and so prefers the society on Mars to the company of so called gentlemen on Earth. Jane is more cautious, reserving her trust and not taken in by appearances, while Carter is extremely uncomfortable with the excessive deference shown by a population used to more callous rulers. The conformity to their characters ensures the plot largely avoids predictability, and while Tarzan remains true to his personality, the way Nelson structures matters shows him in a poor light. It’s clever. Burroughs created his version of Mars in another era, one where naked flesh was only ever seen in the wedding bed, and sometimes not even then. His scantily clad fantasy characters are now somewhat embarrassing, and if remaining true to what he conceived, an artist has little choice but to populate the panels with near naked harem women. 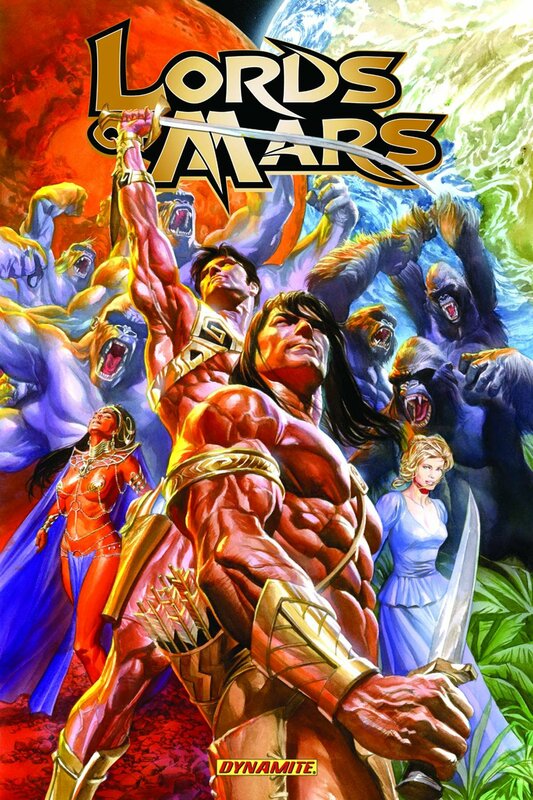 Roberto Castro’s versions are loose and sketchy, underfed in comparison with the overly muscled brutes he makes of Carter and Tarzan. Otherwise he defines the locations and technology well and designs a suitably repulsive obese slug of a man as the Thern ruler. Much is tease. 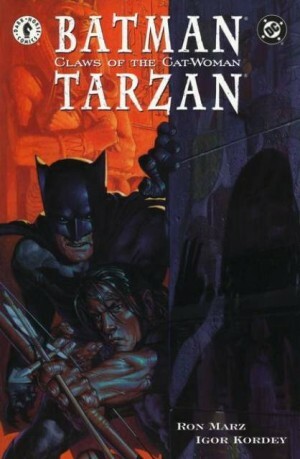 For all the decent work with personality, it’s not until the penultimate chapter that Tarzan actually meets John Carter. Burrough’s fans will probably be sustained long enough by the joy of Tarzan interacting with the people and creatures of another of his creations, but readers just wanting a fast moving fantasy might not appreciate the holding pattern. When Burroughs’ two creations do finally meet, however, it’s all great, leading to an ending suggesting more would follow. It never did.